While criticizing New York Times video, Mondoweiss makes accusatory references to Jews 18 times within the 700-word piece. The notorious, yet popular, anti-Israel website Mondoweiss has posted a new article showing how obsessed its authors are with the traditional anti-Semitic conspiracy of Jews controlling the world's media. Mondoweiss is frequently accused of anti-Semitism, though its staff denies the accusation on the basis that it is run by Jews. While criticizing a New York Times video about its Jerusalem office, Mondoweiss makes accusatory references to Jews or Judaism 18 times within the 700-word piece. These include comments such as "everyone knows that a lot of the pressure on the Times is from Jewish groups, and the Times is owned by Jews," and "Can we expect these editors to address questions of the U.S. Jewish community’s influence over foreign policy honestly?" In the original NYT video, two of the Gray Lady's editors mention how Americans, particularly visitors and philanthropists, have a strong presence in Israel. For Weiss, though, Jews are not true Americans. Convinced that everyone is as obsessed with Jewish control as he is, he comments: "It’s not as if everyone in the room isn't thinking, Jewish." Notably, he suggests that it's only Jews (who are not Americans) that are noticeable in Israel immediately after quoting NYT editor Judy Rudoren say Palestinian-Americans send "a huge amount of money" to the area. Weiss then descends into marking off Jewish Times editors and owners before turning the discussion to Jews' influence over US foreign policy. At no point, though, did Weiss mention Diaa Hadid, one of the most prominent members of the NYT's Jerusalem bureau. Before joining the mainstream press, Hadid contributed to the anti-Israel hate site Electronic Intifada and did public relations for anti-Israel groups. 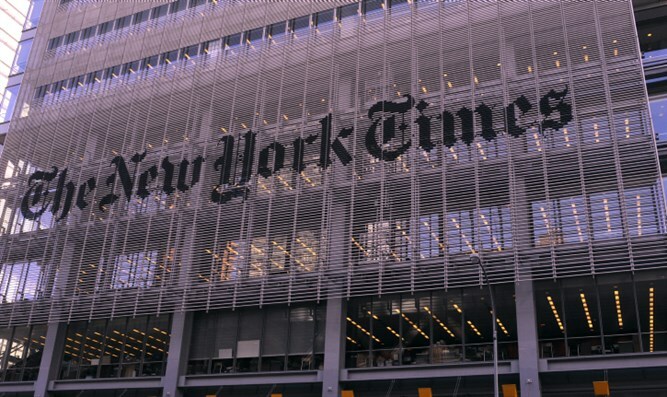 Since she began working for the Times, her editors have been forced to publish several high profile corrections after it was found that Hadid twisted stories or ignored contradictory evidence in order to present Israel in a bad light.